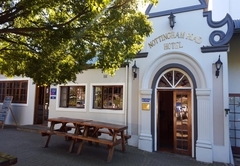 Nottingham Road Hotel is a Nottingham Road hotel providing accommodation in 14 guest rooms for tourists visiting the Natal Midlands region. 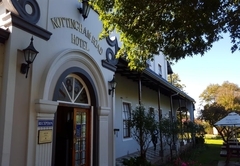 The Legendary Nottingham Road Hotel is located in the heart of Nottingham Road village, close to golfing estates great trout fishing dams and the unique shops of the KwaZulu Natal "Midlands Meander". 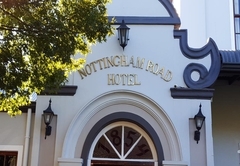 For generations the Nottingham Road Hotel has been the meeting place of travelers, friends, loved ones and new beginnings. 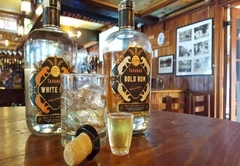 The historic pub holds many a tale of battles lost and won, loves lost and found, and friendships made and renewed in its time scarred wooden panels. 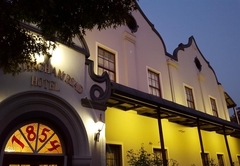 The unique charm and attraction of the Nottingham Road Hotel, established in 1854, has answered the needs of many travelers seeking a hotel steeped in history, beauty and reputation. 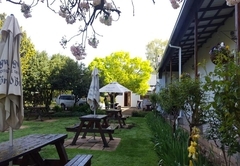 “Notties Hotel” as it is affectionately known to locals is renowned for its festive atmosphere, fine fare and hospitality. 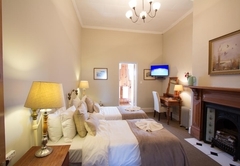 All rooms have DSTV, Complimentary tea and coffee making facilities in the rooms and heaters. 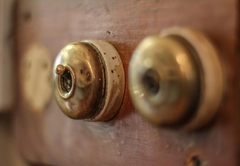 Your rooms will be made up daily once you have vacated the room for your daily activity. Fresh towels are supplied daily. Turn down service will be done every afternoon. Please ask for any extra: blankets, pillows or towels. We offer A la Carte dining and for a more relaxed atmosphere you can unwind in the legendary pub and enjoy a sumptuous traditional pub meal. 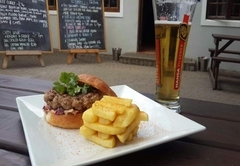 Notties Pub is affectionately known to locals and many past travelers and is renowned for its festive atmosphere, fine fare and warm hospitality and has really stood the test of time with the original wooden pub. Everyone knows the Notties Pub! Even people who have not yet been clever enough to venture up or down hill to Nottingham Road have heard, via some grapevine, of the legendary Notties Pub. 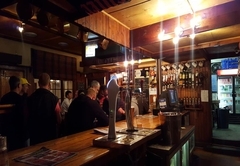 Local sons and daughters, like their parents and grandparents before them, spend many a pleasant night in Notties pub, entering into the same old high spirits! Friday nights at Notties are legendary - there’s hardly weekend that goes past without some kind of fun going on there! 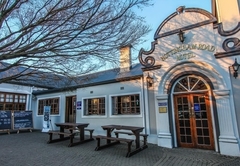 Saturday Rugby fever sees the pub packed - with free breakfast rolls and the odd draught beer on the house to be enjoyed as people help their heroes win the game. The conference venue at the Nottigham Road Hotel can accommodate 60 delegates in Cinema style seating and 30 delegates in U-shape. 2 breakaway rooms are available and all standard equipment is available on request (flip charts, note books, marker pens, screens etc.). Our conference packages are tailor-made according to your requirements. Please contact us for a detailed quote. 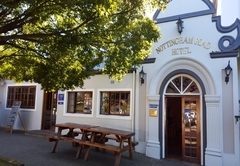 The following activities are on offer from Nottingham Road Hotel. 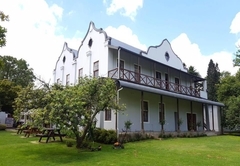 Please contact us for further information, or to book your daily activity: Fly Fishing, Golf, Battle Field Tours, 4X4 Trails & Routes, Sani Pass Tours, Mountain Bike Trails, Forest Walks, Birding Groups, Wine Tasting, Team Building, Day Hydro's & Spas, Horse Rides, Craft Tours, Karkloof Canopy Tours and Giants Castle Trips. 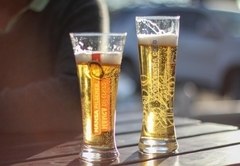 Please note that all activities can be tailor made to suit your needs. 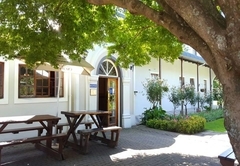 Golfing, Trout Fishing, Hot Air Ballooning, Horse riding, Game drives, Hiking, Cycling and Spa Treatments to name but a few are all available by arrangement and last but not least the famous Midlands Meander with a varied array of arts and crafts in a beautiful and unique country setting. Standard Room with en-suite bathroom. DSTV and Tea/Coffee Making Facilities. 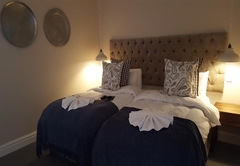 All rooms have DSTV, Complimentary tea and coffee making facilities in the rooms and heaters. 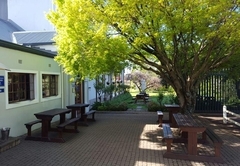 Rooms with en-suite bathroom, DSTV and Tea/Coffee Making Facilities. Each Rooms features it's own small patio. 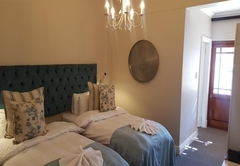 All rooms have DSTV, Complimentary tea and coffee making facilities in the rooms and heaters. I've been visiting for years and have to say... this was the best visit to date. 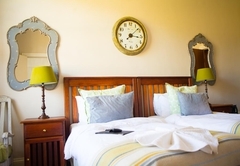 Much improved, service was friendly and faultless, rooms a lot more comfortable than I remember. The hotel has a noisy pub especially on weekends it seems, but it was actually lots of fun and we had a great time! Really glad we chose to stay here again. Thanks chaps! 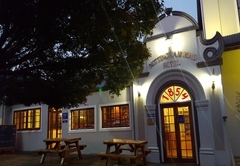 An old hotel with lots of history. Very lively pub on the weekends. We stayed in garden room which was well appointed and quiet. 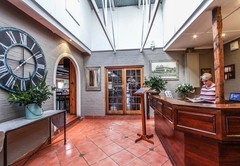 The staff throughout the hotel were excellent and were happy to do anything for you. Honestly could not fault it. Food in restaurant was excellent. A lovely area to explore. Response timeNottingham Road Hotel typically responds to requests in 5-10 minutes. Early check-ins can be arranged in advance. Should you be arriving after midnight, please let us know so that we can arrange a late check-in.